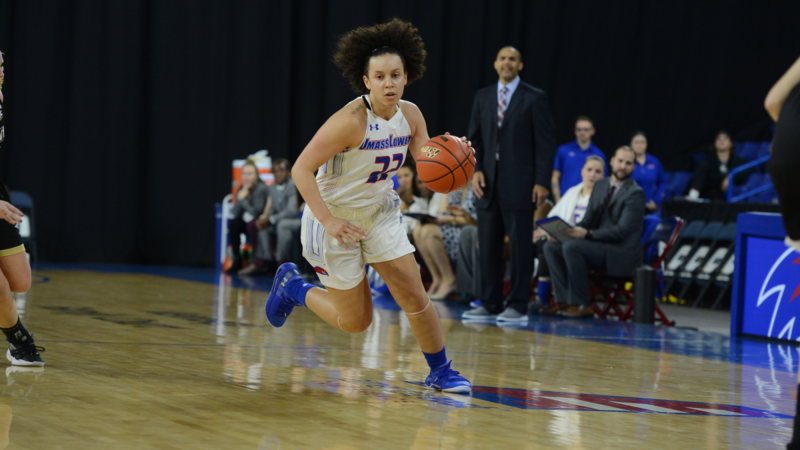 The UMass Lowell women’s basketball team (2-1) won their second straight game 79-45 against the Fisher College Falcons (5-1) in their last home game before heading into a five-game road trip. The back-to-back win marked the first back-to-back win since the 2015-16 season. Junior guard Ren’Cia Rolling was one rebound away from a triple double. She finished the game with 10 points, 10 assists and nine rebounds. Her 10 assists are the first time a UMass Lowell player notched 10 or more assists since 2012. Freshman guard Kharis Idom and sophomore guard Katie McKie set new personal bests with 13 points each. The game started off with a lay-up from senior guard Brianna Rudolph assisted by senior forward Katherine Smith. That began a 4-0 run for the River Hawks. Smith helped anchor the defense giving the River Hawks the lead through the entirety of the game. Sophomore guard Linda Svenne’s two three pointers helped UMass Lowell jump up to a 12-5 lead. The team’s pressing and trapping defense put them up 18-7 after the first quarter. Rudolph started the scoring for UMass Lowell just as she did in the first half. This time she scored off a pull-up three pointer. The River Hawks were 5-10 from the three-point line in the first half. Their efficient scoring combined with their pressing and trapping defense helped the River Hawks go on a 13-5 run through the majority of the second quarter. Senior forward Oda Shackelford and McKie combined for 20 points to put UMass Lowell up 41-20 at the half. The River Hawks held onto their commanding lead for the rest of the game preventing any chance for Fisher College to amount a comeback opportunity. The team finished the finished the fourth quarter by going on an 18-6 run. UMass Lowell finished the game shooting .500 from the field and .429 from three. UMass Lowell will return home to play Colgate at the Costello Athletic Center on Wednesday, Dec. 5 at 7 p.m.